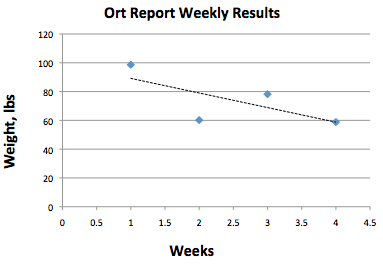 This last Thursday, the 9th, we had collected and weighed our second Ort report, aside from the baseline in February. We collected 115 pounds of food waste, compared to our baseline which weighed in at around 76.5 pounds. It was also more waste than the previous week, which totaled in at 102 pounds. Let’s try harder to cut down on leaving excess scraps by thinking about how much food we want and are able to eat. Being trayless in the dining hall helps reduce the amount of food students waste, and we aim to meet our goal to have under 50 pounds of waste. This amount was the minimum wasted from 2014, so we need to improve our habits and try again this week. An Ort Report will be taken this Thursday, so keep your eyes peeled, and stay green! 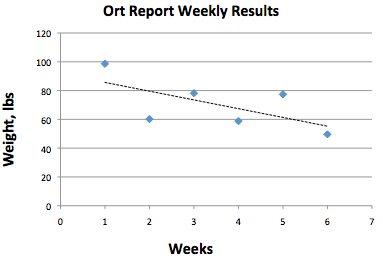 This weeks Ort Report measurements are the best so far! We weighed a total of 49.6 pounds of leftovers from students’ and teachers’ plates! As always, we look forward to improving even more. Our improvements so far show that the students have become much more aware of the impact of their waste. We look forward to setting a specific goal for diners to reach! This week Sustainable Life Club had collected and measured a total of 77.4 pounds of food waste for the Ort Report. Last week we had a startling amount of 55.8 pounds, 20 pounds less than this week. Hopefully week four measurements will help students and faculty at Williston aim to get around 55.8 pounds or less. Overall, the average of food waste for the past five weeks have averaged to 74.64 pounds. The first week had measured around 98 pounds, so the slope is continuing on a decreasing slant (see graph). Although Ort Report is succeeding in helping students realize their impact on the environment through their food waste on Mondays, the measurements are inconsistent. 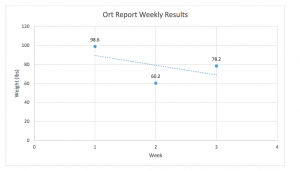 The goal of the Ort Report is to help students be aware of their impact even when measurements are not taken throughout the week and try to create a consistent habits for students and faculty. Hopefully, over the last weeks of the Second Trimester, the average will continue to lower as we become more environmentally conscious, including days beyond Monday. 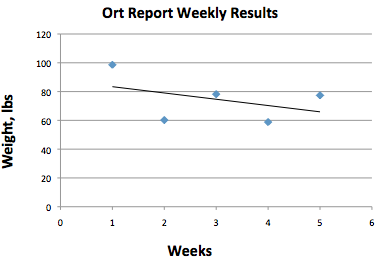 This week’s results from the Ort Report! 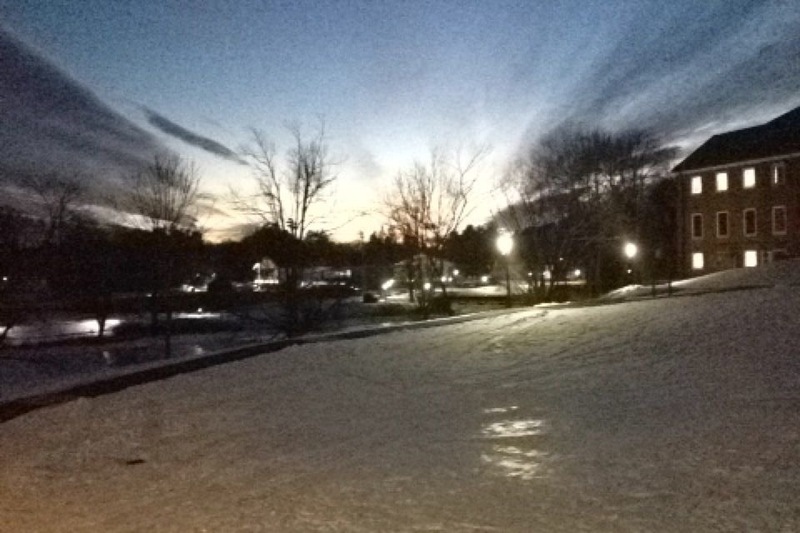 This week’s Ort leftovers set a new record since we started this winter! On Monday the total food waste added up to be 58.8 pounds! When this project first started, we had about 98 pounds of waste, so students and faculty are making a difference and reducing less. The weekly trend is still continuing on a downward slope. Hopefully people continue not wasting and reducing, and making new records lower than 58 pounds. Overall, these numbers may be a good example and initiative to waste less, but is not the goal of The Sustainable Life Club. We hope to help create good habits and inform others about their impact on the environment. Ort report is not taken daily, but every Monday. This trend in the graph shows great work, but the real challenge is to continue this habit throughout the week. Overall, keep up the good work reducing! Weight of waste collected in the Dining Hall for each week! 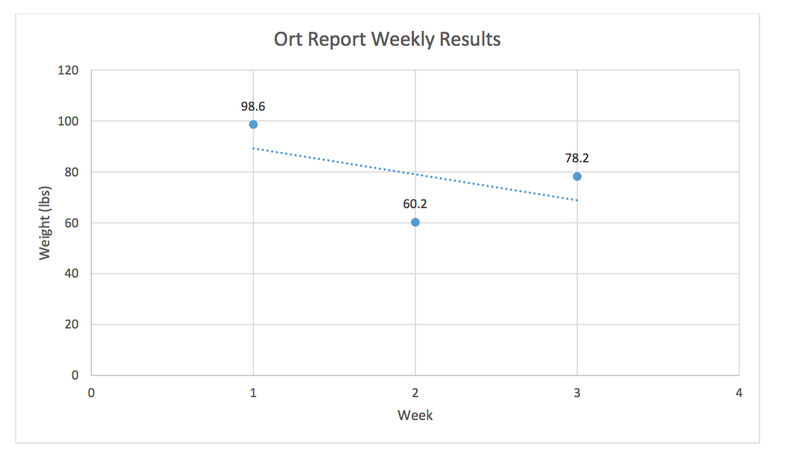 This week’s Ort Report measurement is great! We recorded a total of 78.2 pounds of waste! Now that we have collected three weeks of results, we have put together a graph to represent each week’s recordings! We will be adding results to this graph each week! The trend line is already on a downward slope! Even though the measurements are a good representation of how the school is doing in the Ort Report, the Sustainable Life Club hopes to focus on more than just the numbers. We hope to help students and faculty gain a greater understanding and knowledge of their impact on the environment! Encouraging you to think about your impact, we hope that this thoughtfulness will translate into other parts of your daily life!